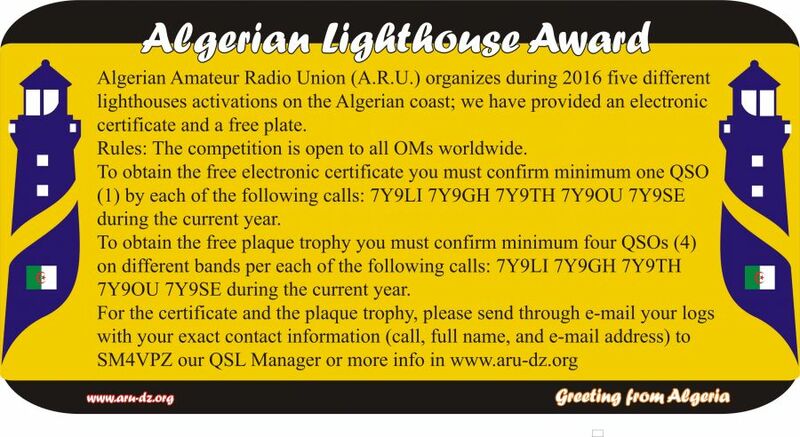 Algerian Amateur Radio Union (ARU) organizes during 2016 five different lighthouses activations on the Algerian coast. We have provided an electronic certificate and a free plate. The competition is open to all OMs worldwide. 1 By each of the following calls: 7Y9LI, 7Y9GH, 7Y9TH, 7Y9OU, 7Y9SE during the current year. To obtain the free plaque trophy you must confirm minimum of four QSOs on different bands. For the certificate and the plaque trophy, plase send through e-mail your logs with your exact contact information (call, full name, and email ads) to SM4VPZ our QSL manager or more info on adu-dz.orz.